What's your community resolution for 2019? Have you checked out our Community Connections Facebook page lately? It's your connection to what 's happening in our local community. Operation Medicine Cabinet Cleanout all the time! Did you know all of our police stations now have permanent drug take-back boxes? Bring your unused or unneeded medications to your local district station for a safe, convenient, and responsible way of disposing of drugs. Also, look for a survey on the OP3 news coming to your inbox next week. Fairfax County's Volunteer Management System serves 15 agencies, 25 programs and has more than 10,400 volunteers! The value of the volunteer hours to the County is more than $44,000,000! As OP3 embraces 2019 we look ahead toward opportunities to partner in new and exciting ways with our for-profit and nonprofit partners. Give Together brings volunteers to celebrate Martin Luther King's Legacy by performing hands on volunteering. Join friends and neighbors in honoring Dr. King’s legacy by serving your community. Lots of opportunities both indoor and outdoor to give back. Benefitting Embry Rucker Community Shelter will be held January 27, 2019 at the Hyatt Regency Reston. This community tradition of gathering together for a hilarious evening of political satire is all for an important cause – to help families in our community. Volunteer Fairfax is accepting nominations for its Volunteer Service Awards through February 8 for its 2019 awards. Nominate an outstanding volunteer for a these outstanding community award. During the Government Shutdown Fairfax County has posted information on the web on how workers can get and give assistance. Many private organizations are offering both financial and other assistance to furloughed workers. Volunteer Fairfax and USA Today has a comprehensive list of assistance, freebies and specials available. 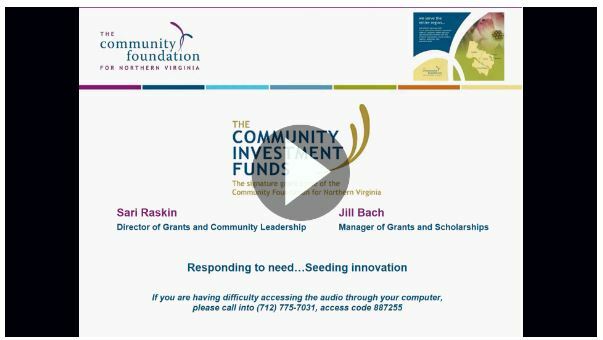 The 2019 Community Investment Funds Grant Cycle is now open and accepting applications! Grant applications are due by Thursday, February 14 by 5:00 pm. Applications are being accepted in the areas of Child and Youth Development, Education, Poverty Relief, and Military Personnel & Their Families.